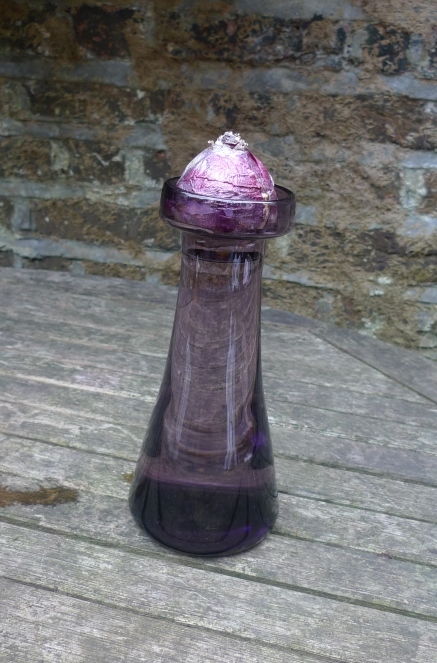 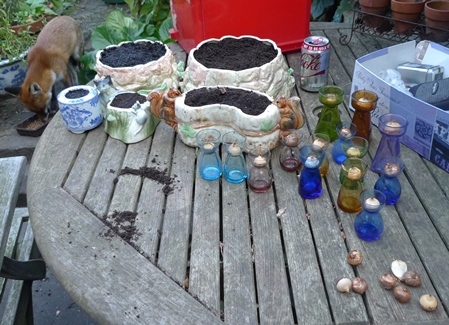 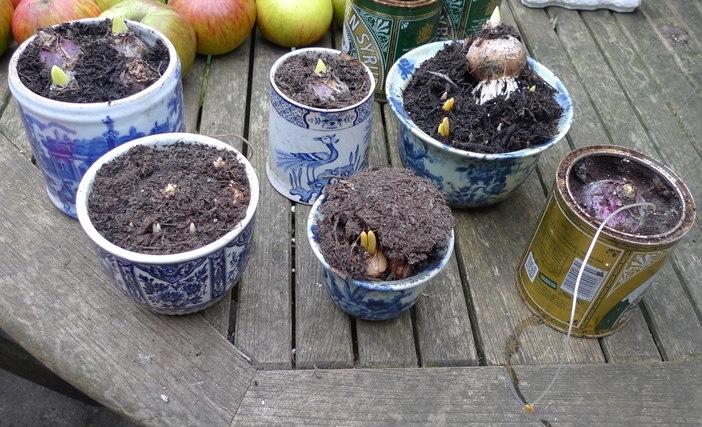 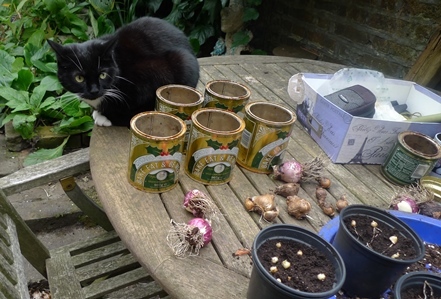 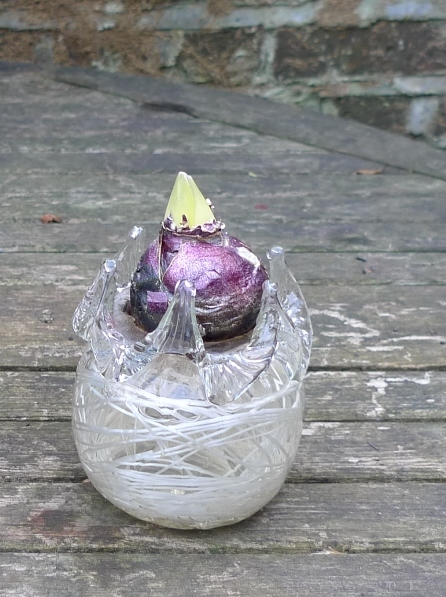 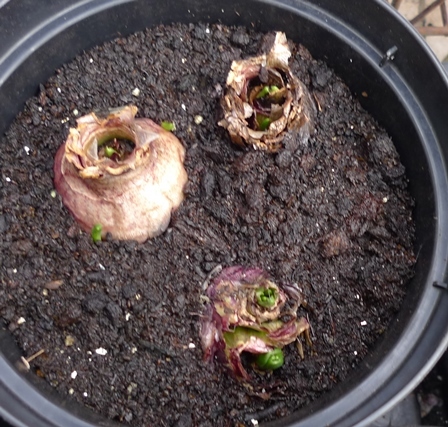 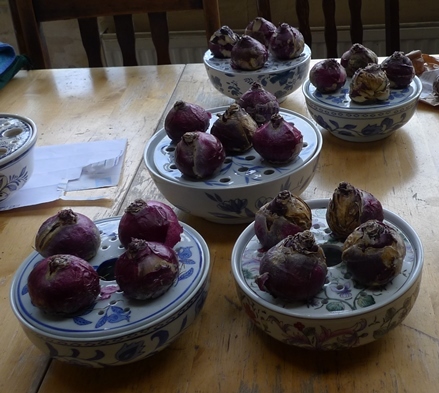 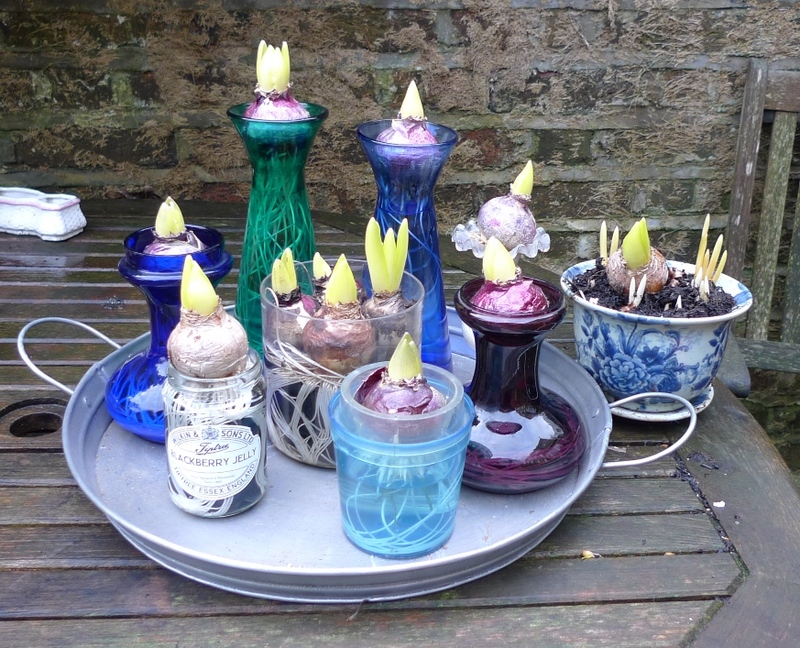 These are all my hyacinth bulbs out of the dark so far. After the first lot shown below from December 1st, I took more out the next day. I want to show how the bulbs look when they are ready to come out of the dark. 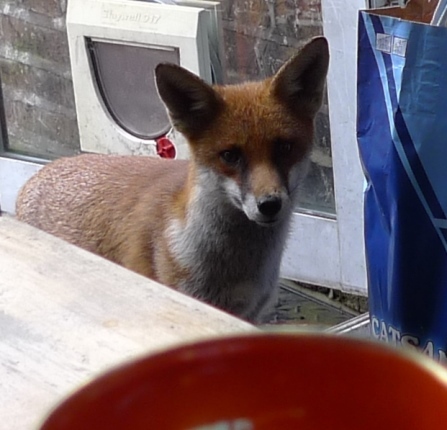 Maybe some of this is my instinct and experience but I like making things as easy as possible so anyone can do it. 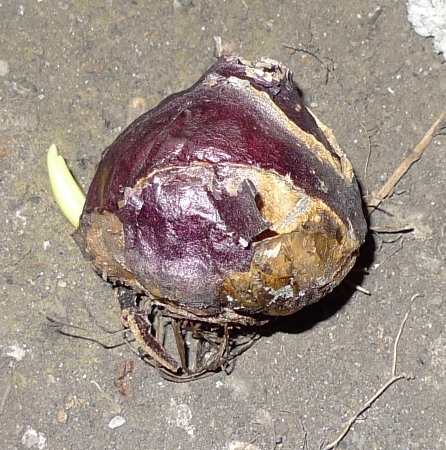 The bulbs in the front, left and right, show the green flower emerging from the bulbs. 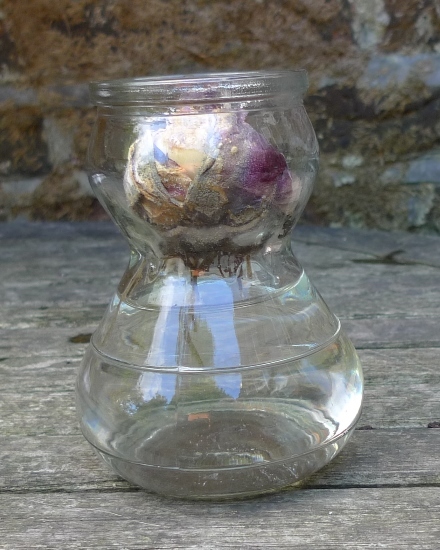 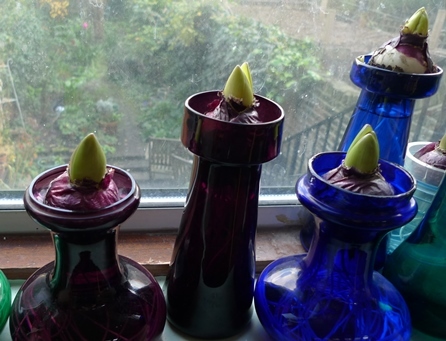 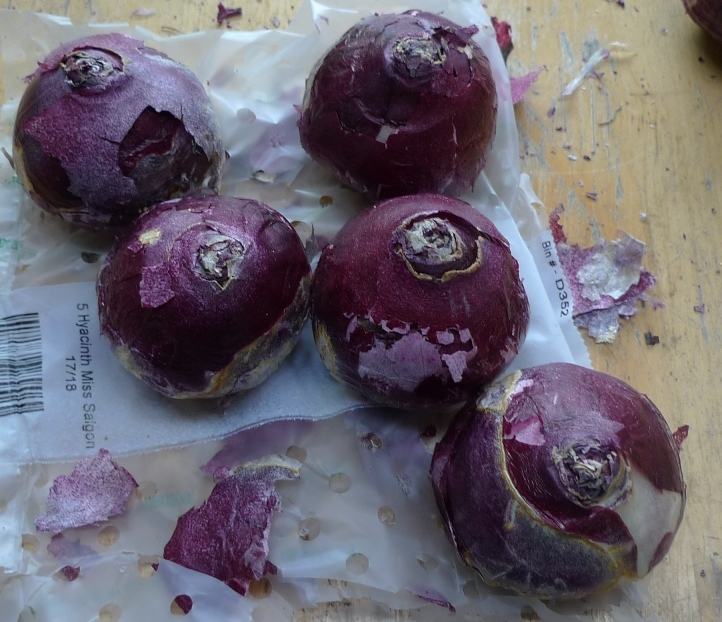 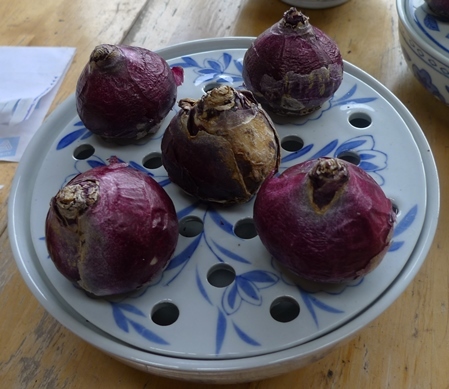 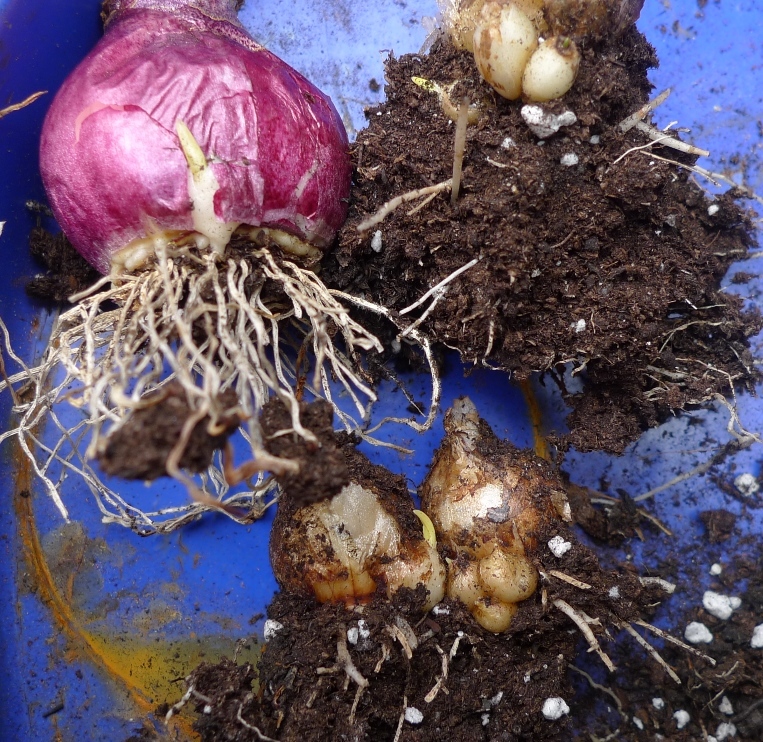 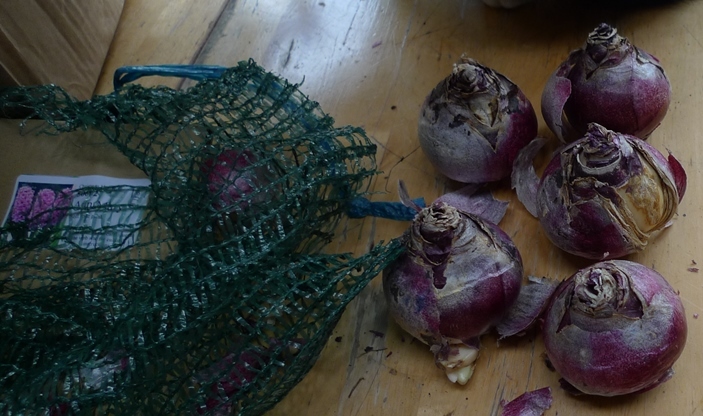 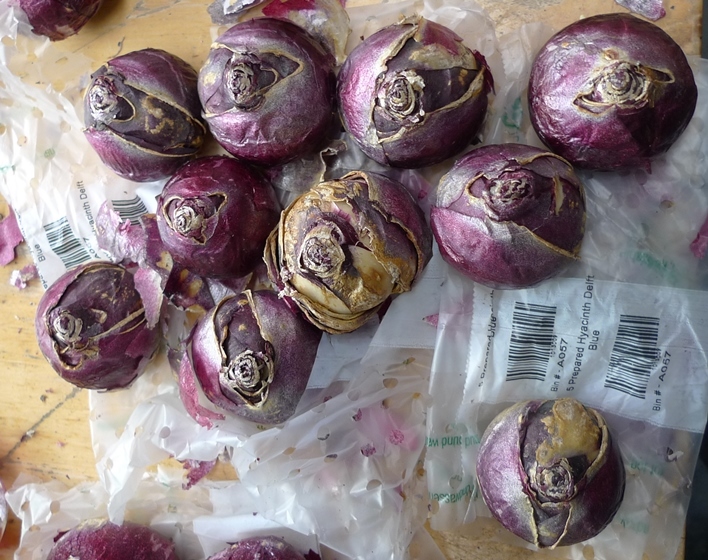 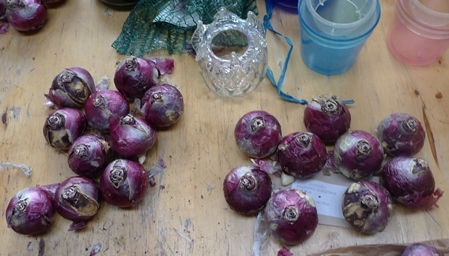 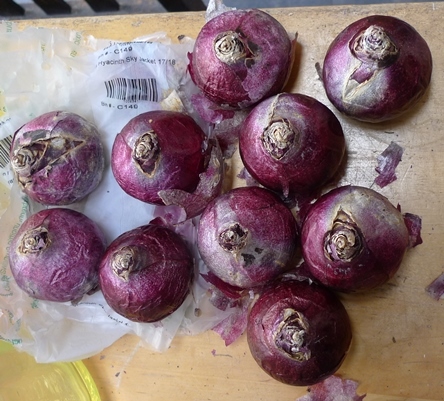 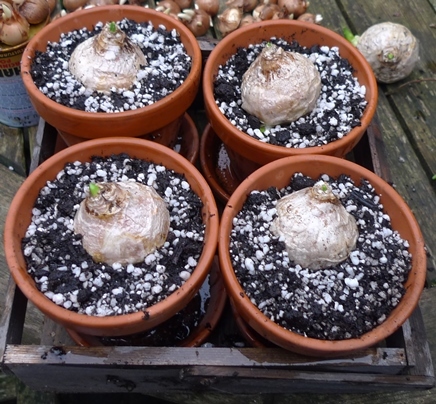 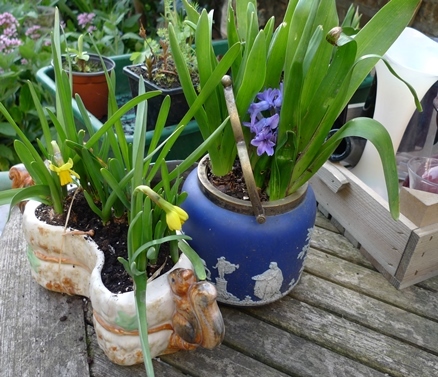 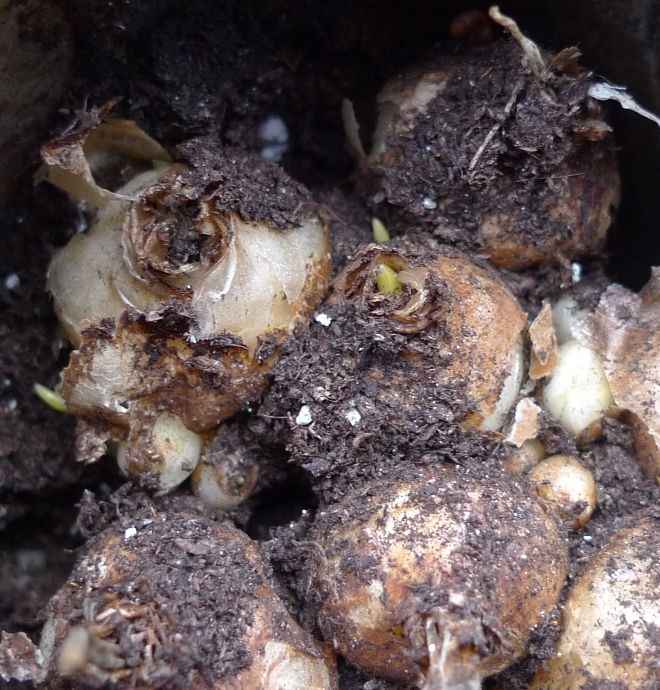 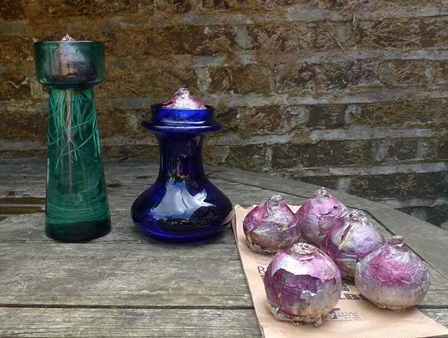 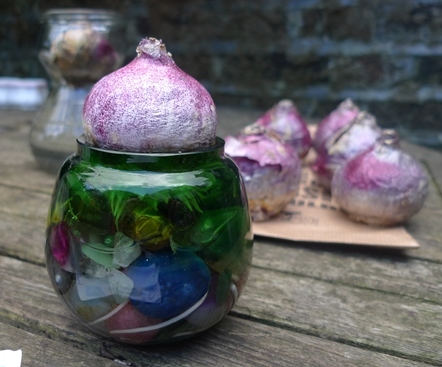 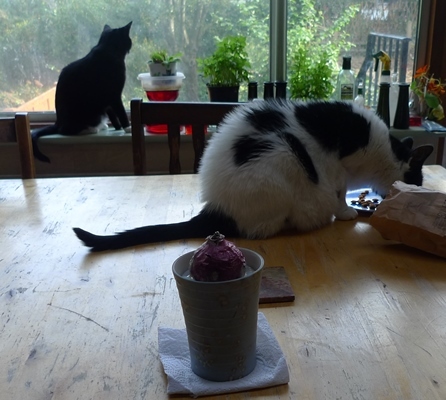 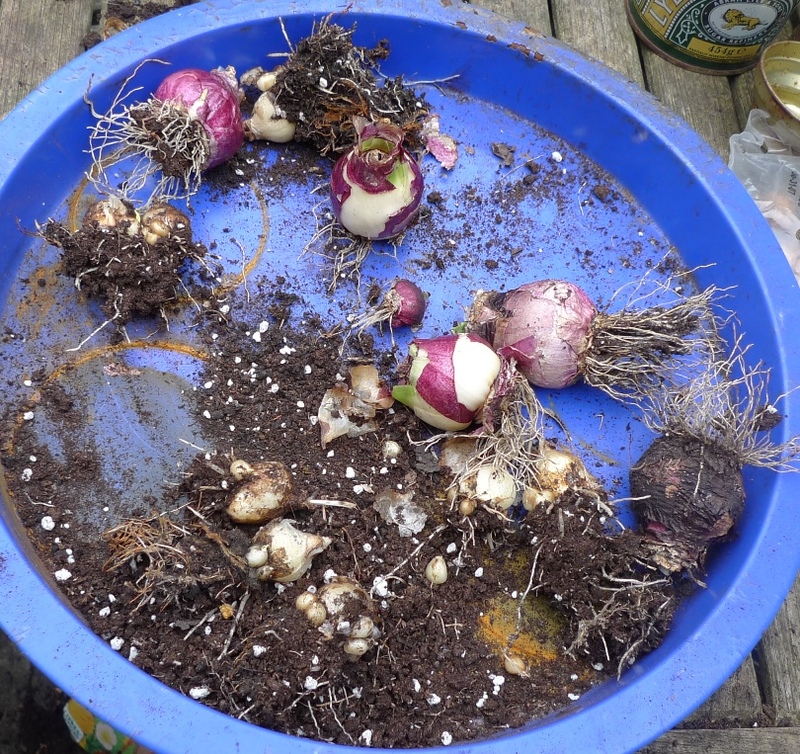 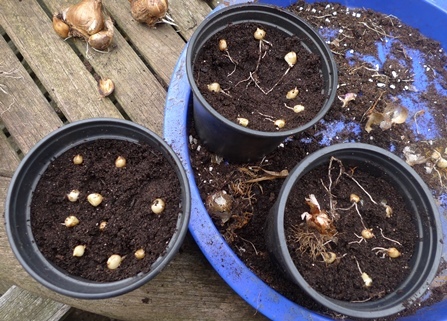 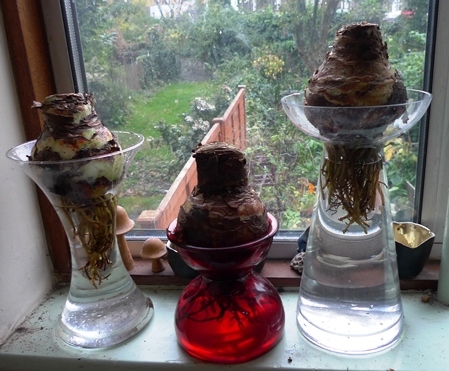 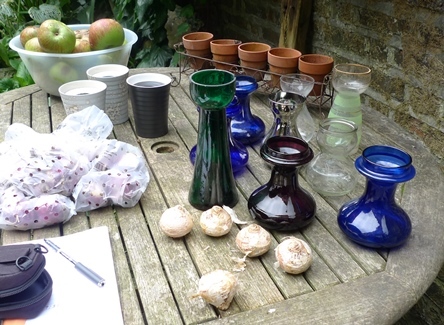 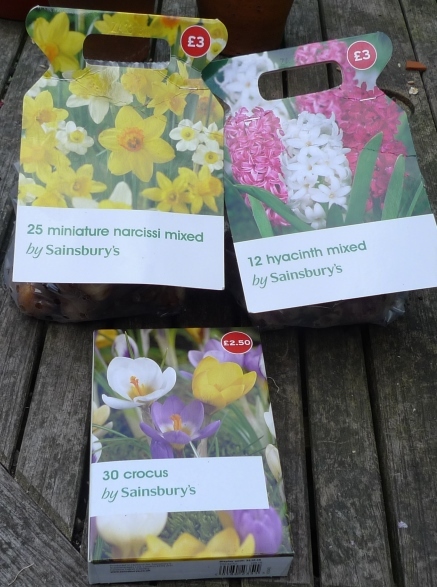 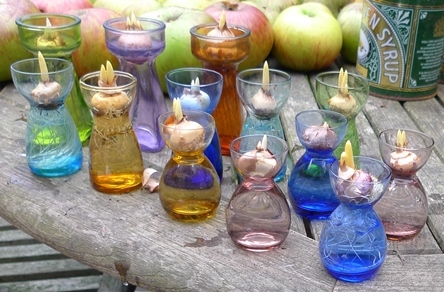 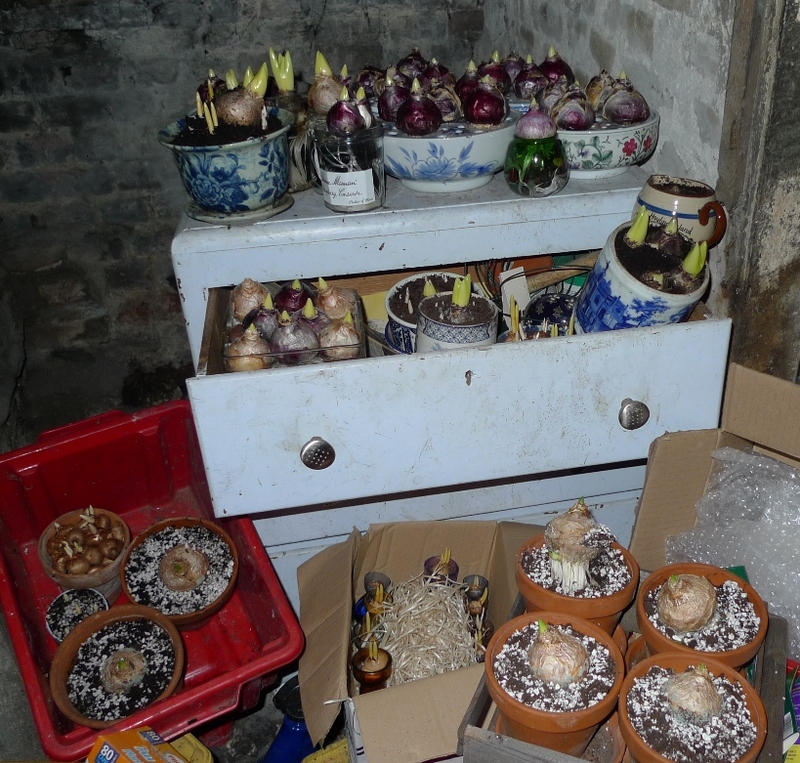 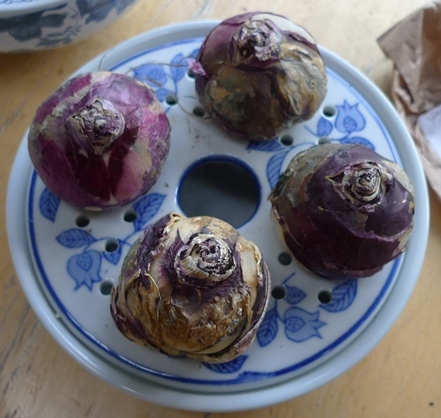 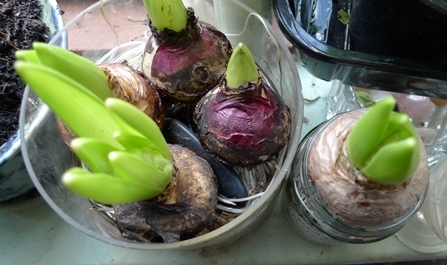 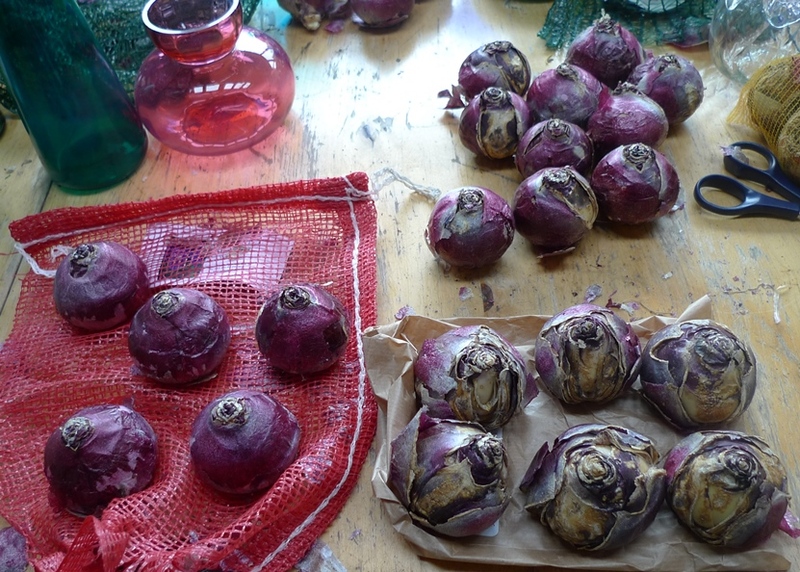 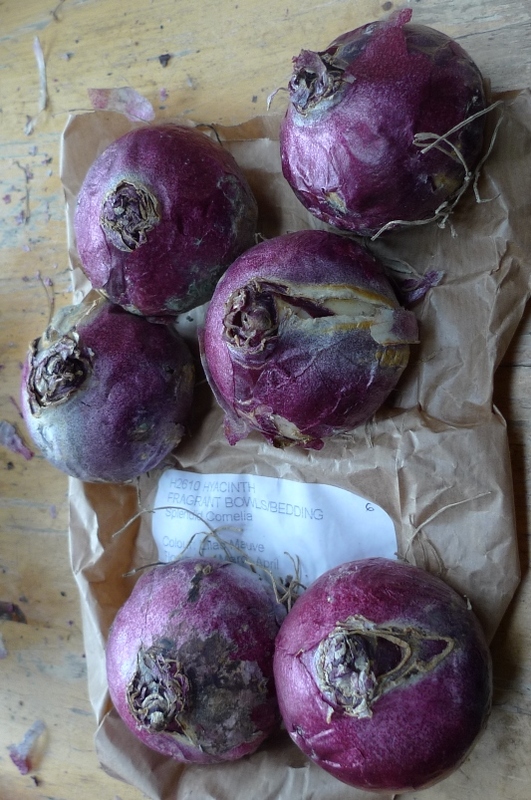 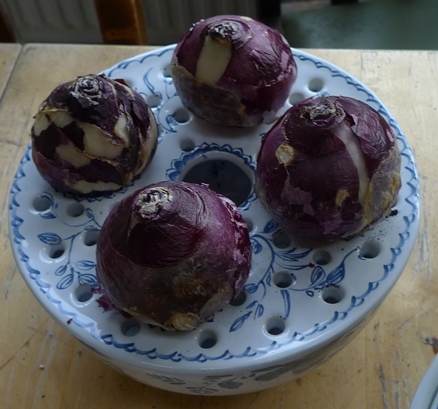 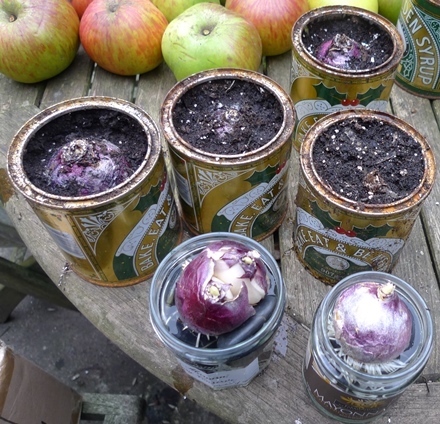 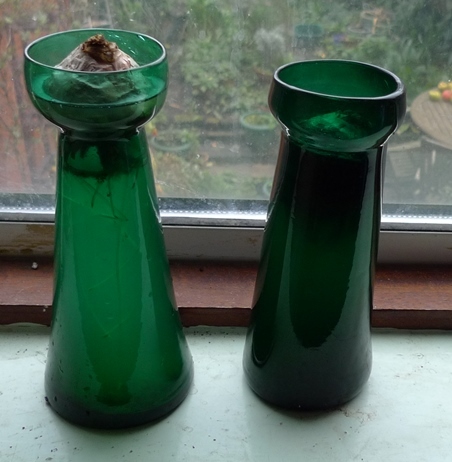 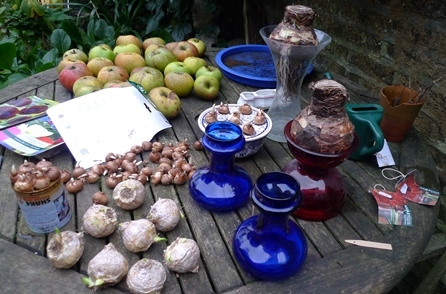 The downside of a container with more than one bulb, whether bulb fibre or pebbles and water (as on the left), the bulbs may develop at different rates, eg the one in the middle is noticeably smaller. I guess I tend to bring the container out into the light when some bulbs are ready and hope the less developed bulbs catch up. 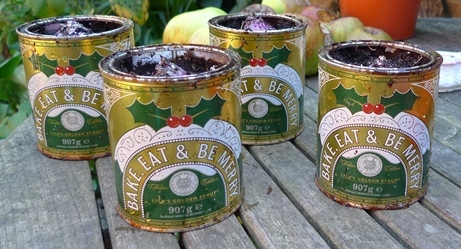 December 1st is the traditional time to get bulbs out of the dark if they are to bloom by Christmas. 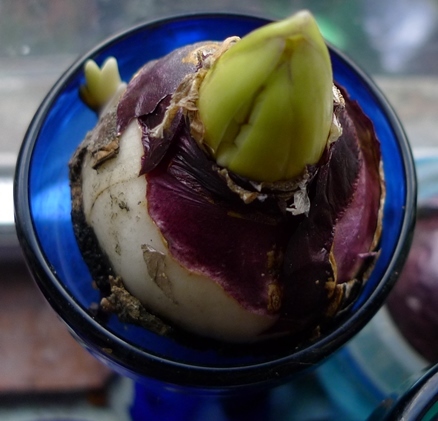 They need to have the bulge of the flower out of the bulb. 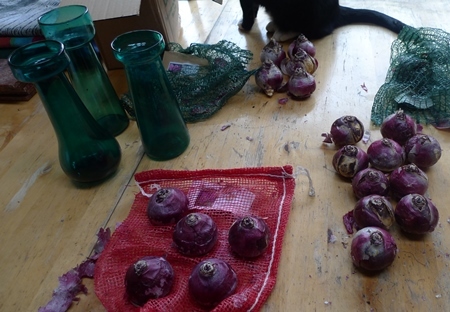 This was my first lot out of the cellar. 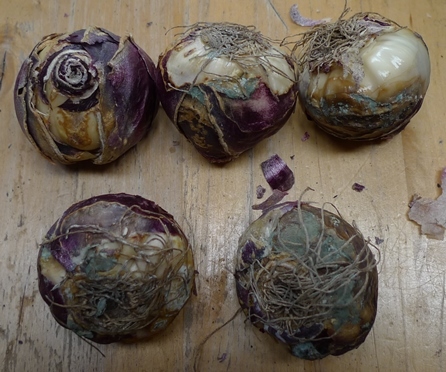 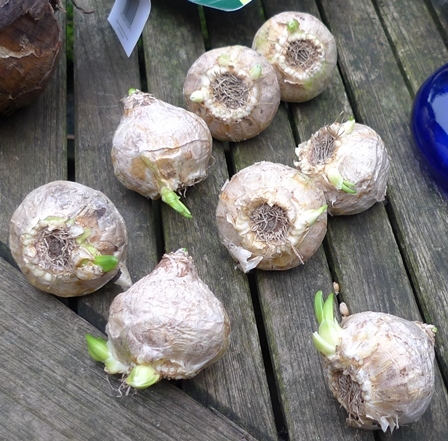 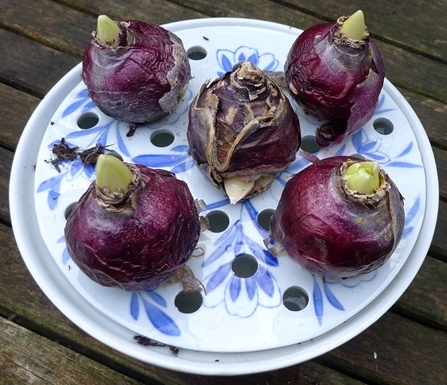 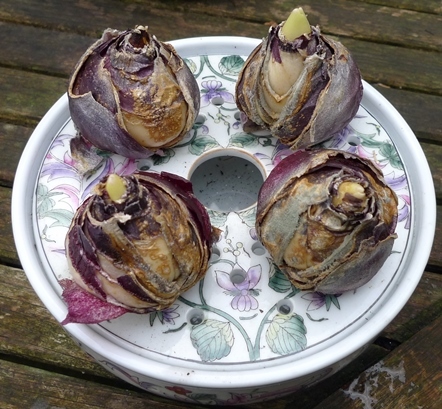 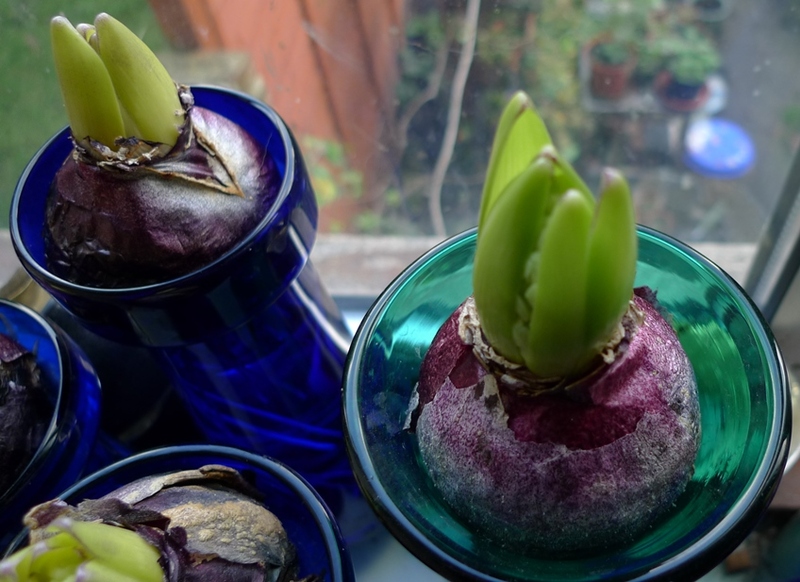 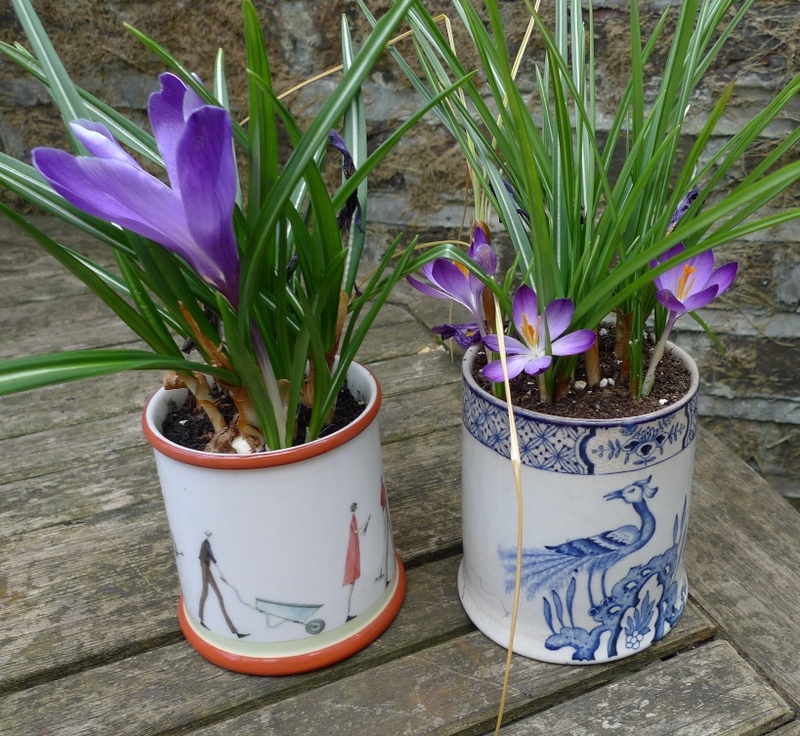 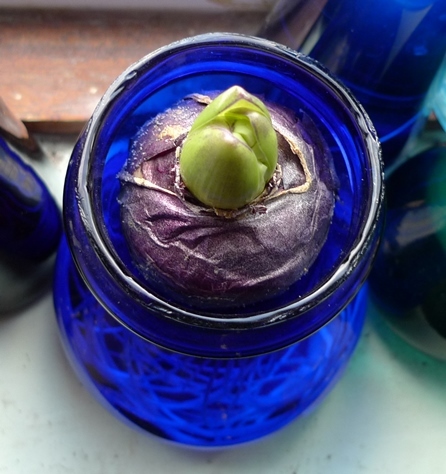 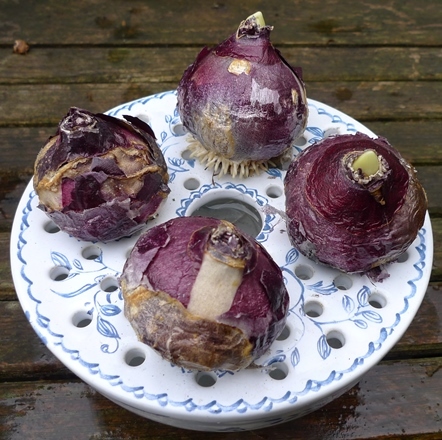 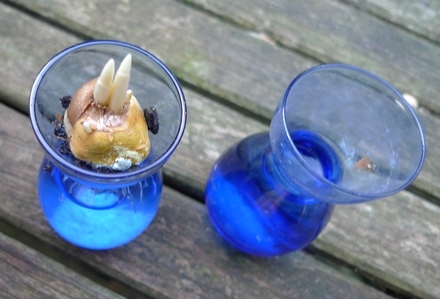 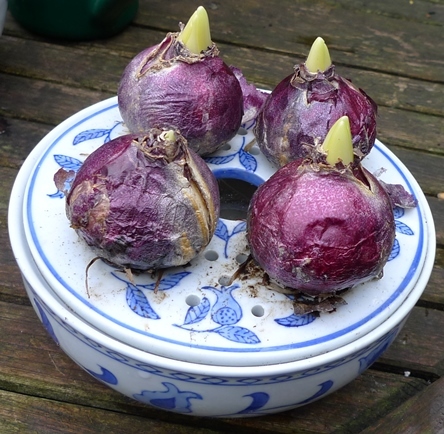 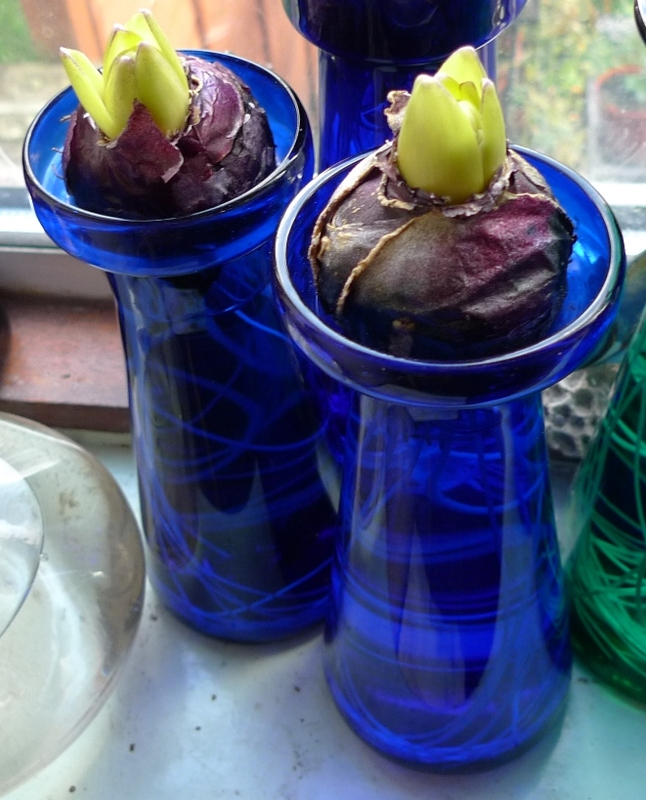 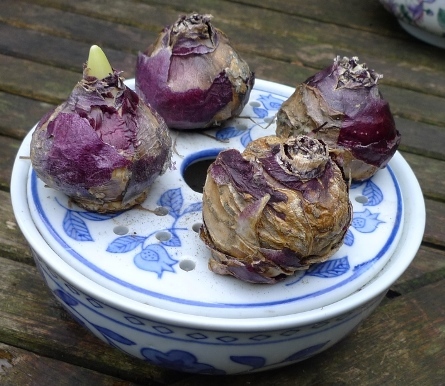 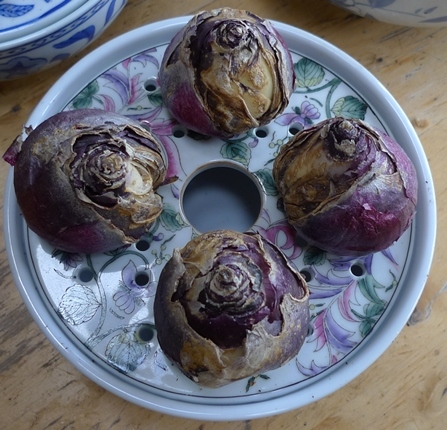 Some of the bulbs have differently shaped buds depending on which variety, eg back left looks like Delft Blue, the small one in the frilled vase back right looks distinctive, can't remember the variety right now but I can say not Delft Blue. 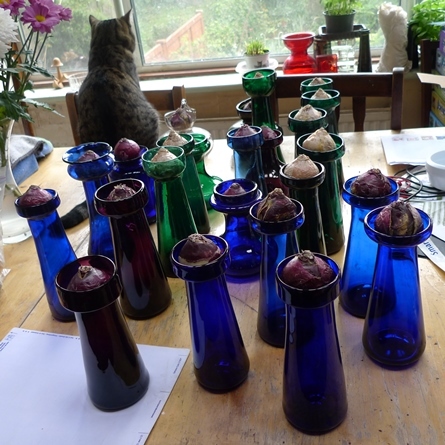 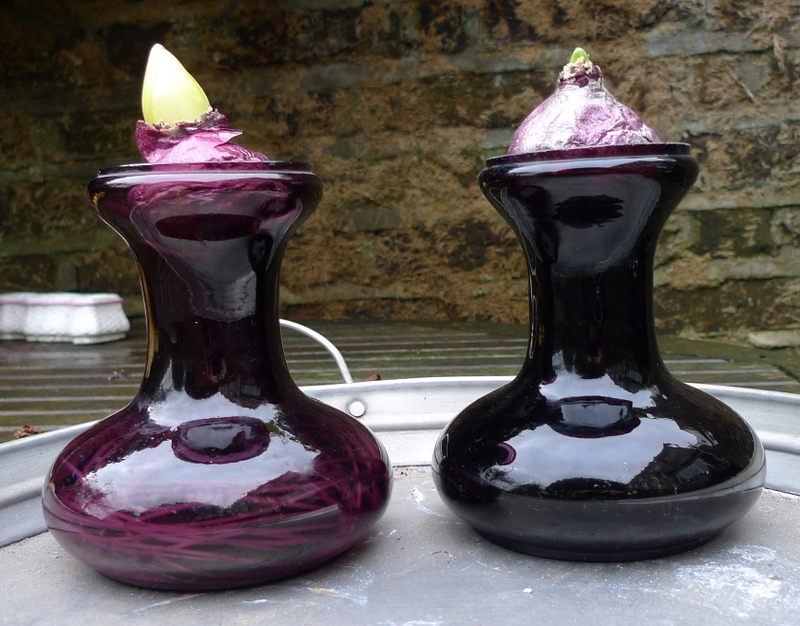 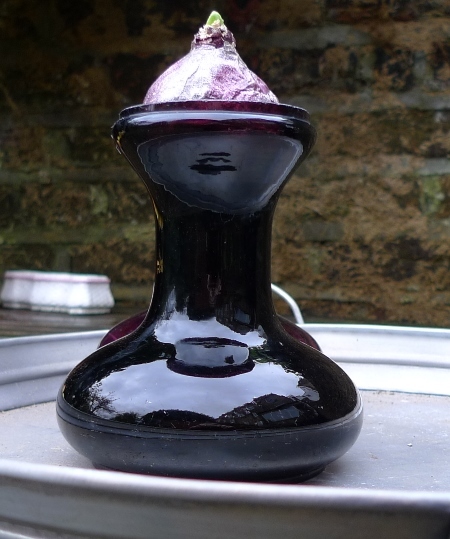 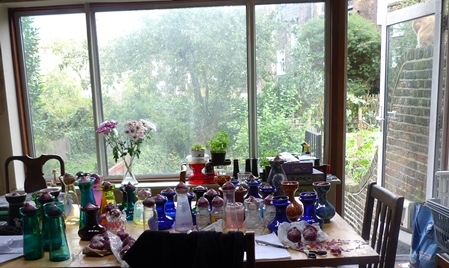 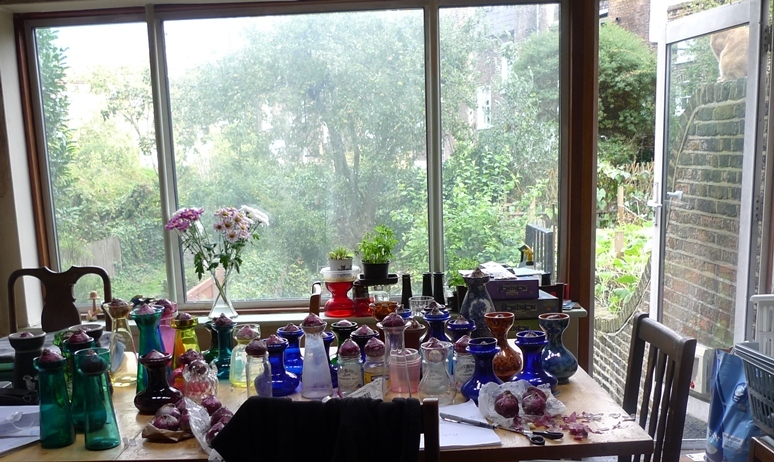 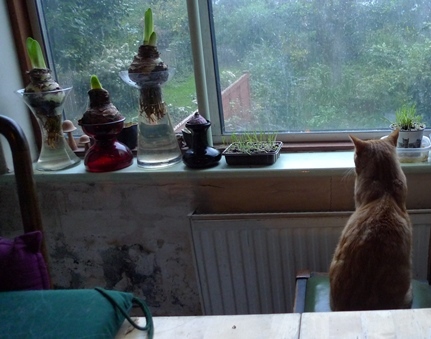 Will check my notes later today and update which varieties are in each vase.